All the animal cases use the same main body part and are assembled in a similar way. Foam is very easy to sew. You just have to remember not to pull tightly on your stitches. You can choose to use glue instead or do some parts by sewing and some with glue. If you do use glue, be sure the areas are dried before trying to sew the case together. You can choose to use felt also. Just like foam, felt will work great and the edges do not fray. Sew or glue as many body parts on before sewing the main body together. Parts such as spikes and manes will get sandwiched in between the two main body parts and you can glue these on before hand. The cases can hold pens, pencils, eyeglasses, notes and anything else you may want to stick in them. Send someone a letter and slide it inside one of the animals. Not only will they have your words, but they will be getting a little gift also! Print out the animal pattern that you want and cut out all pieces. Refer to the diagram placement on each of the patterns along the way. The pencil case patterns will download in a PDF document in a separate window. You will need Adobe Reader to open and read them. OWL- Take one body part to use as the front. Sew tummy pad on the bottom of this front piece. Place the eye pad on the face and sew. Do the same for the beak and the little feather at the top. Place this front body on top of the other body piece and start sewing.Remember that with all the animals, you will be leaving the top edge open. I usually begin sewing at the top right hand corner, go across the bottom and up the left side. Sandwich wings in between as you go and sew them right along with the body. Glue on eyes. FROG- Place eye pads along top edge of one body part and sew them on along edge. Sew face on to the other body, placing tongue inside as you go. Sew on spots. Make sure eye pad seams are on the inside and put both body parts together. Sew together. Glue legs on the back side. Glue on eyes. DRAGON- Glue teeth to face. Sew face to one body part, inserting tongue. Glue on eye pads. Sew spot on to the corner. Glue spikes onto back piece. Put body parts together, making sure the glued edge of the spikes is inside the body and sew body together. Glue on eyes. GIRAFFE- Sew head onto one body part. Sew on spots. Draw the nostrils with a marker. Glue antlers and ears at the top of the back piece. Put body parts together and sew closed, inserting the tail along one side, as you go.You can glue two pom poms on top of antlers. BEE- Sew face on one body part. Sew on eye pad. Glue the 2 stripes on. Sew body together, placing corner spot onto right bottom corner and inserting the wings inside on both sides.Glue on eyes. COW- Sew nose on to face. Glue horns on top and ears on the sides of one body piece. Be sure the glued edges of these are on the inside when you put the body pieces together. Place the body pieces together and lay the face on top. Sew together, inserting tail as you go. 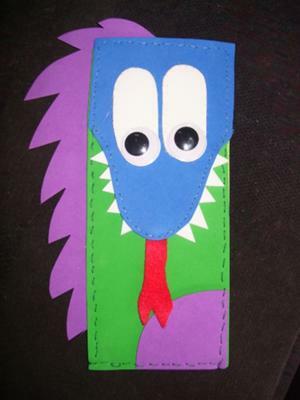 Draw on mouth and nostrils with marker.Glue on spots and eyes.Cut slits at end of tail. ELEPHANT- Lay jowls on face and then the trunk on top of that. Sew to face. Glue inner ears to outer ears. Put the body pieces together and lay the face on top.If you want a tail, use the one from the Cow pattern and insert it as you go. Sew together. Glue on eyes and trunk tip. LION- Glue nose onto face. Glue mane on to one body part. Place face on top of mane. Sew heart on to tummy.Take the other body part and glue ears into place. Glue tail parts on also. Refer to picture on pattern page for placement. Put body parts together, being sure the glued edges are on the inside and sew body together.Glue on eyes and tail tip. MONKEY- Similar as the others.Glue inner ears to outer ears. Refer to picture on pattern for placement. PENGUIN- Similar as the others. Refer to picture on pattern for placement. PIG- Similar as the others.Draw nostrils and mouth on snout with marker. Refer to picture on pattern for placement. ZEBRA- Cut stripes from black foam. Follow the picture on pattern and glue stripes on to one body part. Cut wide stripe and glue on to bottom. Glue nose to face and draw nostrils on with marker.Put face on the body part with the stripes. Glue in mane on the other body part. Put pieces together and sew body, making sure mane glue edge is on the inside. Insert tail as you sew. Glue on eyes and tail tip.Cut slits along mane as shown in diagram. Do the same with tail tip. 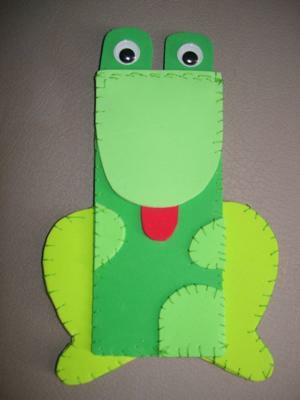 This is a cute and easy project that smaller children could do. Great idea to make all sorts of animals, You then have a larger selection. 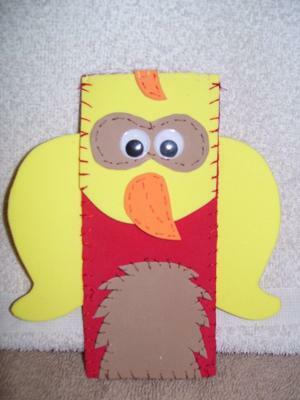 Thanks for your feedback and this would be a great craft for school! I usually get my foam from Wal Mart. You can buy single sheets or a package of many colors. Dollar Tree sells a package of foam but it is a smaller size and the sheets are thinner. The cases can also be made out of felt which is very easy for kid's to work with. You can find felt at Wal Mart also. Happy Crafting! Very cute idea. Thanks for the patterns. Will have to try out with sewing class for kids sometime. Where do you buy the foam?